The only Japanese team competing in an international lunar probe contest said Wednesday it will postpone the launch of its rover to the Moon from Dec. 28 as scheduled to between January and March next year. The decision by the team HAKUTO -- one of five teams shortlisted in the world's first contest of its kind organized by the X Prize Foundation -- comes in response to an announcement by the U.S. foundation that it has extended the deadline for the participants to fulfill their mission to the end of March from the end of this year. HAKUTO said it will carry the 58-centimeter-long rover named SORATO to India next month to prepare for its launch aboard an Indian rocket. 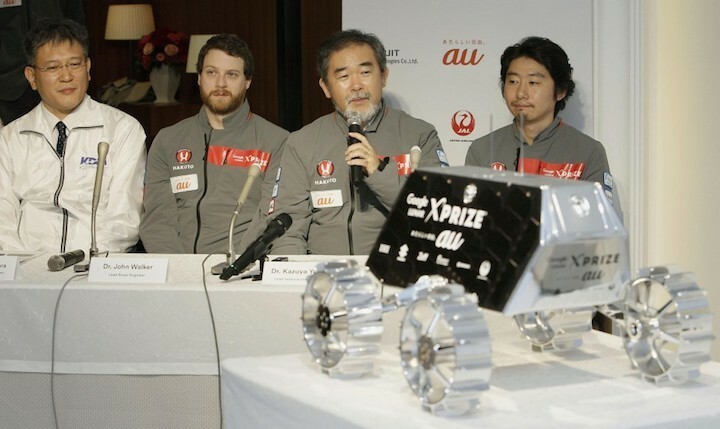 On the same day, the Japanese team gained approval for its plan to compete in the Google Lunar Xprize contest from the X Prize Foundation after its representatives visited Japan to check whether the team's probe plan is technically feasible. During meetings with the representatives between Monday and Wednesday, HAKUTO members explained the details of its plan, such as the route SORATO will run on the Moon and how it will take pictures and videos and send them to Earth. The Google Lunar Xprize is a $20 million inducement prize competition that encourages engineers, entrepreneurs and innovators from all over the world to develop low-cost methods of robotic space exploration. "The Google Lunar Xprize competition was meant to spark true innovation in space exploration, and we are thrilled to witness this first-hand during the Mission Review with team HAKUTO in Japan," said Chanda Gonzales-Mowrer, a senior director of the contest. Takeshi Hakamada, the HAKUTO team leader, said, "Even though we reached a major milestone today, we will stay focused and continue to work hard to complete the rover development and accomplish the Google Lunar Xprize mission." Other than HAKUTO, the four teams participating in the contest are SpaceIL from Israel, Moon Express from the United States, TeamIndus from India, and an international team dubbed Synergy Moon, according to the foundation. They will compete in such fields as having their rovers move more than 500 meters on the surface of the Moon and sending high-definition moving and static pictures to Earth. The team that can achieve the fastest transmission of images will get the prize money. In addition to the grand price, the spacecraft that successfully completes one orbit around the Moon or enters a direct descent approach to the lunar surface will get $1.75 million, and the spacecraft that transmits data proving it has made a soft-landing on the lunar surface will win $3 million, the foundation said. The name of the team HAKUTO, meaning white rabbit, is a reference to the Japanese folktale wherein the shape of a rabbit can be seen in the dark areas of the lunar surface.